I’ve written about Peruvian food before, when discussing one of my favorite downtown lunch options, Si Senor. (Which, incidentally should be opening any day now in a new, more convenient, location.) And as much as I love Peruvian food, Tania loves it more. She lived there for several years, and last year took me back with her to show me around. She only almost got me killed once, as far as we know—although there was a close call with something that may or may not have been a Chullachaqui. Although a traditional Peruvian dish, Lomo saltado would probably qualify as a type of “Asian fusion.” It’s a stir fry with beef, peppers, tomatoes, onions, and….french fries. 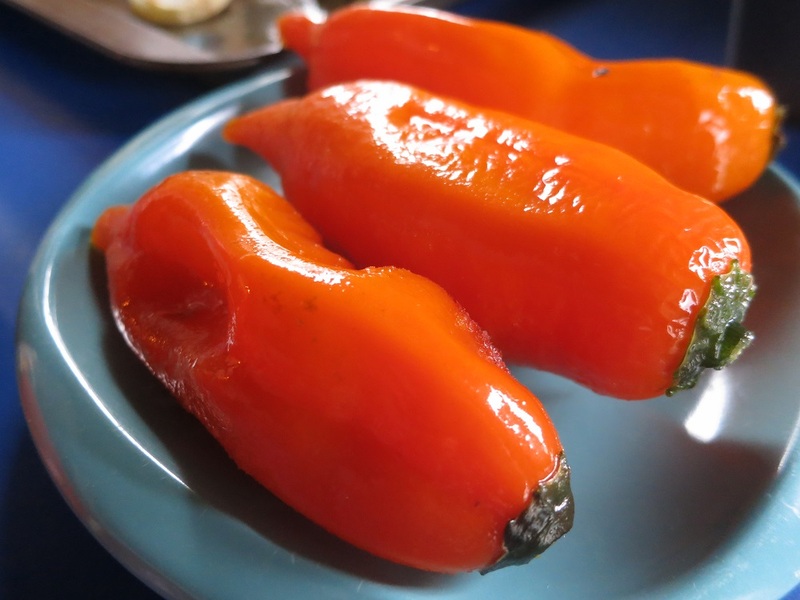 The way you know that it’s a Peruvian dish however, and not just some mishmash of things found in a stoner’s cupboard, is that it features the corner stone of Peruvian cuisine: the aji amarillo pepper. 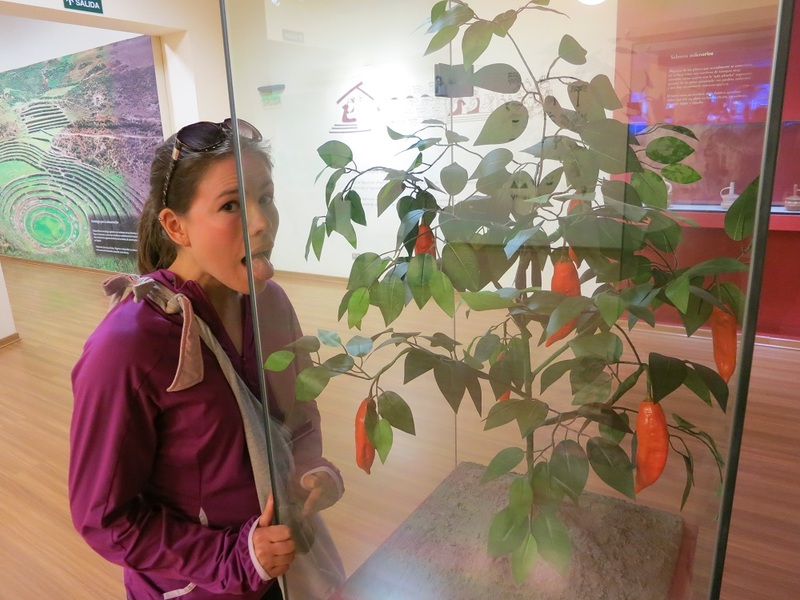 The aji amarillo is so essential to Peruvian cooking that it has a place of honor in the Museum of Peruvian Gastronomy — a museum dedicated ENTIRELY to Peruvian food. For the longest time, Tania and I had wanted to make a variety of Peruvian food. But it is absolutely impossible to even consider it without ajis. A while back, I splurged and ordered jarred ajis from a place online, paying almost as much in shipping as the peppers themselves cost. Then, we went to Jungle Jim’s in Cincinnati and discovered that not only did they have jarred ajis, but they also had frozen ones. So we were getting warmer—Cincinnati was better than ordering online. Thawed ajis obtained from Jungle Jim’s. But thankfully they can be obtained here in Columbus as well. BUT! Columbus is better than Cincinnati. So you can imagine our great joy when we visited the newly-opened Saraga International Grocery and discovered that any Peruvian ingredients we could get at Jungle Jim’s we could also get at Saraga. That means, if you’re inspired to make your own lomo saltado, the ingredients are just a short trip up I-71 away. Peppers taken care of, it was time to confront another issue posed by the lomo saltado recipe. It requires french fries—and I had never made them before. I’m sure it would be possible to use frozen ones and just bake them. But we were going all out and didn’t want to take short cuts. 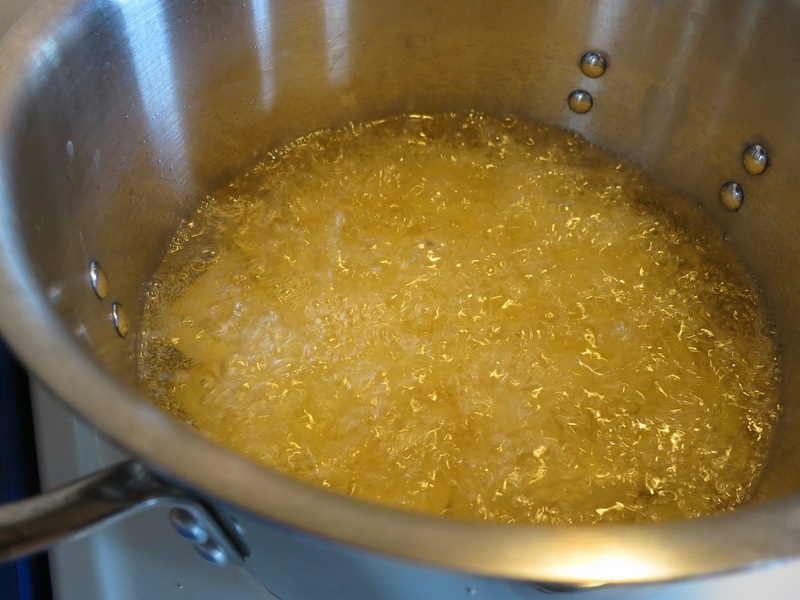 I did some research and discovered the somewhat counterintuitive technique of frying in cold/room temperature oil. 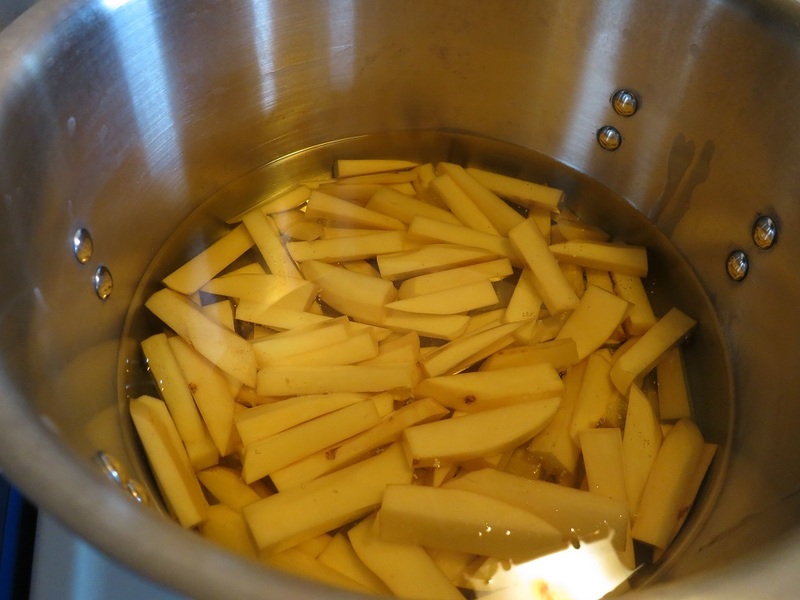 Described by some as the “Robuchon method,” cold frying received rave reviews online. And, supposedly Cooks Illustrated at one time determined that fries prepared in such a fashion actually absorbed less oil and contained less fat. Based on all that, we gave it a try. And it worked out phenomenally! Potatoes chopped and covered in room temperature oil. The fries bubbling away. We cooked ours over higher heat than most recipes online called for. They turned out great and took less time than was described in other recipes. 1. 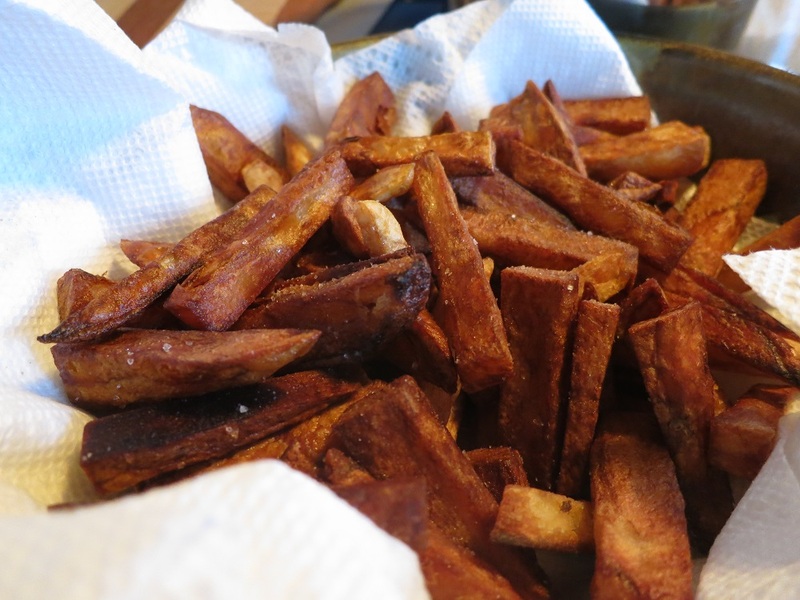 Peel potatoes and cut into fry size—around 3/8” or so. 2. Place in a heavy bottomed pan. 5. Turn after a while to make sure the fries are not sticking. 6. Transfer to a paper towel to drain. Season with salt. Really, it was super easy. In the future, if I need to make french fries, this is the method I’m going to use. One question I have though is what to do with the leftover oil. I know it can be reused, but I don’t fry things often enough to really make it worth it to hold onto the used oil. Ideas? Now that we had mastered the art of french-frying, it was on to the main event. 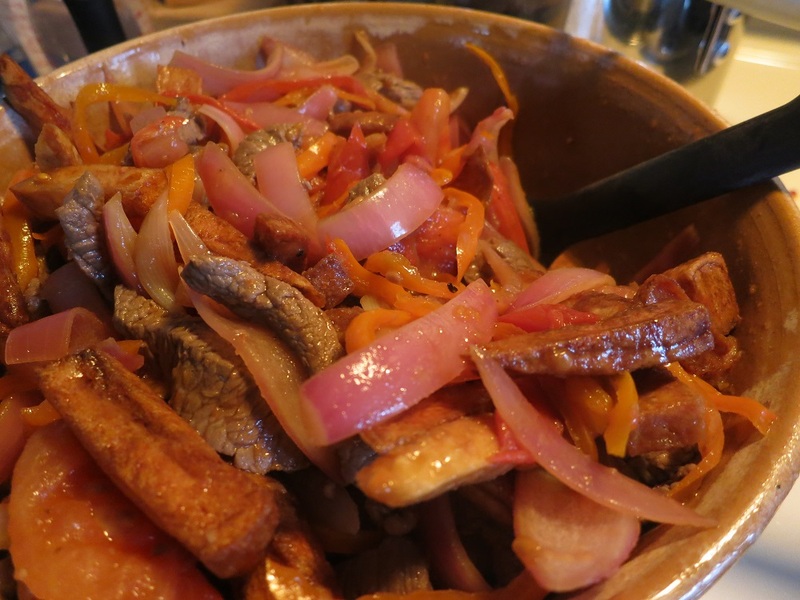 The recipe we had for lomo saltado came from an amazing Peruvian cookbook I had bought for Tania a couple of Christmases ago. 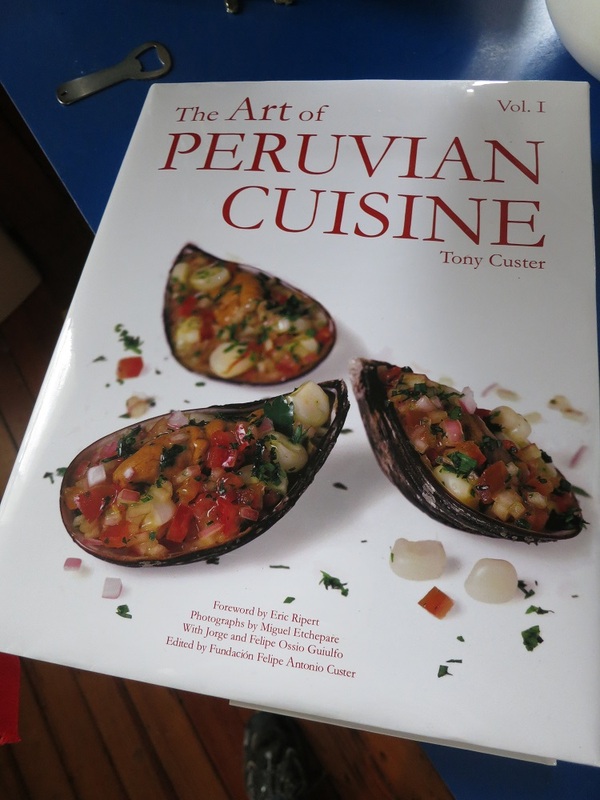 Entitled The Art of Peruvian Cuisine, the book really is a work of art in and of itself. (Buy it here.) Each recipe takes up a full two-page spread with the recipe on one side and a gorgeous photo on the other. 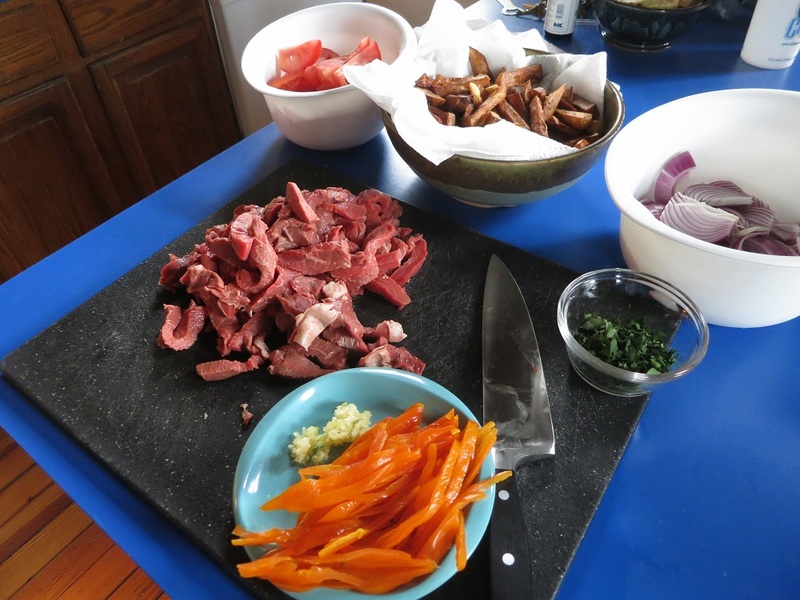 The lomo saltado was actually the first entrée we had cooked from the book. But judging how well the pisco sour recipe had turned out, we knew it would be great. Before moving on to the recipe, I’ll offer this by way of warning: as written the recipe prepares a MASSIVE amount of food. Following it to the letter, it overwhelmed the wok I was cooking it in. I would advise you to cut the recipe in half at least, particularly if it’s your first time making it and particularly particularly if you’re making it for just one or two people. 1. Cut meat into ½ inch wide strips. 2. Heat enough oil to cover the base of a large pan or work, and over medium heat, sauté garlic and aji limo for 2 minutes. Raise the heat, add meat and brown all over. Season with salt, freshly ground pepper and a pinch of ground cumin. 3. Remove the meat from the pan along with the juices. Set aside. 4. Add a little more oil to the pan if necessary and stir-fry until barely soft, about 1 minute. Season with salt and pepper. Add a few drops of vinegar and continue stir-frying until it has evaporated, about another minute. The onion should still have some bit. Remove onion from the pan, set aside and repeat procedure with tomato. 5. Return meat, onion, and tomato to the pan. Add aji Amarillo and soy sauce and cook for ½ minute. Add the french fries and mix everything together. 6. Garnish with freshly chopped cilantro and serve over white rice.